If only I am ambidextrous so I can do my nails on my own! But doing it by myself is not as much fun and relaxing as going to a nail salon. Yes, I am one of those girls who looks forward to a nail salon day! I simply love having my nails done. I have tried several nail salons here in Manila and I must say there's only one nail salon that satisfied me in terms of quality service -- Cocomo Nail Spa. I've been with them for more than 3 years! So if you're looking for a nail salon in San Juan area, this is definitely the place to be. As an artist, I acquired the habit of paying attention to details. I expect the same when it comes to cleaning my nails and applying nail polish. If there's one thing I'm always proud to mention about Cocomo Nail Spa, it's how neat my nails look every visit. Pulido silang gumawa! It would be a shame to post close-up shots of my nails in this blog if they're not close-up worthy. Do check out some of my nail shots here. I'm currently in the mood for dark nail polishes. Imagine how your nails will look up close when the sides are not properly cleaned after applying nail polish. 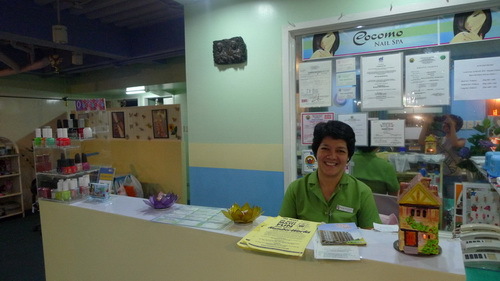 The moment you enter Cocomo Nail Spa, you will be greeted with a smile. The people here are very friendly and accommodating. This is Ms. Monic. You will often see her sitting behind the reception counter. She will take care of your appointments and makes sure that you're pampered on your visit. Cocomo Nail Spa has a very relaxing ambiance. 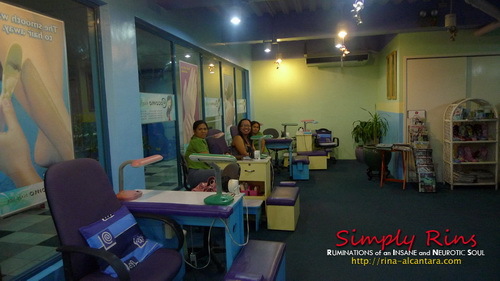 Unlike most nail salons here in Manila, Cocomo Nail Spa has a spacious interior. There is ample space between cleaning stations. You don't have to worry about bumping into other clients. Their nail technicians can freely move around without disturbing other customers or a fellow staff. You can simply sit back and relax. Didn't I just say that the nail salon is spacious? This is the view from the right side of the reception counter. Cocomo Nail Spa can accommodate at least 12 clients simultaneously without worrying the shop will be too crowded to move around. 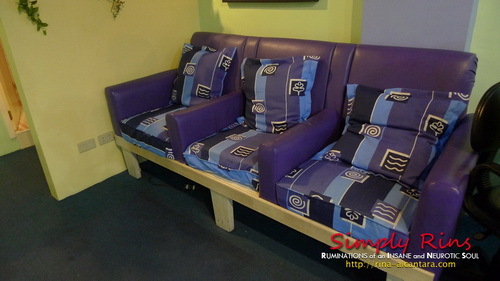 If you're with friends or your partner, and would like to sit close to each other, you may opt to sit here. If you're only a getting a foot spa, this couch seems to be a better alternative than one of the cleaning stations. I'm sure by now, you've notice the lamps in the cleaning tables. They have a purpose, and a very good one too. It's easier to do anything when it's well-lighted! This is Malou, my favorite manicurist! Very patient and keen in cleaning and applying nail polish. The lamps are not the spotlight type and I think the ones they have are better because it lights the entire table with ease! Most nail salons don't even have portable lamps. I find these lights essential for nail technicians. I've had several incidents wherein I got injured by a technician while doing my nails because of poor lighting. Clearly, lights in the ceilings are not enough! This is Tessa, my favorite pedicurist! Yay! Don't worry, I have a photo where you can see her face. This picture was taken without a flash and look how well-lighted it is. Notice the pink utility box on the left? Each nail technician has one. It has everything they need! See those small benches? That's where your pedicurist sits while pampering your feet. It's important that the nail technicians are comfortable for them to do their work efficiently. I see that most nail salons have their technicians sitting on a small stool that is less than a foot high. Sitting in such stool for an hour or so will make your rear sore. Cocomo Nail Spa offers a wide array of nail care and spa treatments designed to create the ultimate feel-good experience every woman deserves. This is pampering at it's best! Acrylic Nails - A method of nail enhancement to strengthen and lengthen the nails using coats of acrylic resin. Manicure and Pedicure - Adheres to the highest standards of nail care. All implements are sanitized before use. Ends with a relaxing had or food massage. Spa Manicure - Hands are pampered with exfoliating lotion and a cold wax treatment, then wrapped snugly in terrycloth mittens for 10 minutes. Relaxing massage prepares hands for a regular manicure. Spa Pedicure - Feet are soaked in a soothing bath, then a gentle exfoliating lotion is applied to remove dead skin cells. Includes removal of corns and calluses, if required. An aromatherapy massage follows exfoliation and a splash of cool body spray will leave your feet refreshed, relaxed and ready for a regular pedicure. Deluxe Foot Spa - One of the most requested services! This is the ultimate pampering treatment for feet. One whole hour that includes exfoliation with fruit grains, removal of corns and calluses, and leg massage. Paraffin Treatments - These relaxing treatments will leave your hands and feet feeling baby soft. After exfoliation, hands/feet are dipped in warm, moisturizing paraffin wax, then wrapped snugly in terrycloth mittens/booties for 15 minutes. Special oils are then massaged into the skin until hands/feet become smooth, silky and rejuvenated. Nail Art Design - Nail art is a great way to express yourself. Have little ribbons or flowers adorn your fingertips. Add rhinestones for extra glitz. Paint on different cartoon and comic book characters. Select from various french manicure designs. Cost depends on intricacy and amount of designs selected. Aromatherapy Facial - This is a must for stressed-out skin or "just want to be pampered" skin. We use 100% pure essential oils to blend into the facial massage and mask. This is a complete treatment, with the most relaxing facial massage. Cocomo Facial - A detoxifying treatment which removes congestion and dead cell build-up. Patterned after the classic European Facial, this includes deap pore cleansing, a luxurious massage, steaming, mask, toning and hydrating. Express Facial - This is ideal for someone who is on the run. Basic 5 steps: cleanse, exfoliate, steam, extract, and moisturize. Calming Back Facial - Our specialized treatment to unclog blocked pores on the back. Offers many benefits - detoxification, scrub, extractions, massage to relax sore and aching muscles. Body Waxing - Unwanted hair is removed temporarily by applying a thin layer of melted wax onto desired area and quickly removed with cloth strip. Over a period of time, this treatment slows down hair growth. The hair in the treated area will grow back finer and softer than before. Aromatherapy Massage - A soothing body massage for detoxifying and total relaxation. Using a pure imported essential oil will strengthen the immune system. Soft music and a scented oil burner will complete your relaxation treatment. Fusion Massage - A delightful blend of massage therapies from different parts of the globe. Taking the best of tui-na (China), shiatsu (Japan), classic Swedish massage and adding reflexology with acupressure/stretching. This is certainly a treat to rejuvenate and enhance personal well-being. 1/2 Hour Massage - Ideal for "spot treatments" to relieve trouble spots and tight aching muscles. Foot and Leg Massage - Using the combination of Chinese and Swedish massage, this is a perfect partner with your manicure. Paraffin Facial Treatment - 5 coats of unscented paraffin wax is applied to the face leaving the skin totally moisturized and rejuvenated. Topped off by a light facial to relax sore and aching muscles. Paraffin Back Treatment - Your choice of scented paraffin wax applied generously to the back leading one to an experience of total relaxation. Wax is peeled off leaving the back moisturized and refreshed. Topped off by a soothing 30 minute back massage. A brand new way to beat the "stress". Body Scrub - A body treatment using fruity grains to gently scrub off dead skin cells and build up of lotions. After a refreshing shower, a light massage using scented lotions will leave the skin with a new glow. From left: Rina, Janice, Tessa, ME!, and Malou. They were getting ready to go home before I insisted for a photo with them. This is the day I colored my nails yellow! Just in time for Noynoy Aquino's oath taking this June 30, 2010. Check out my yellow nails here. 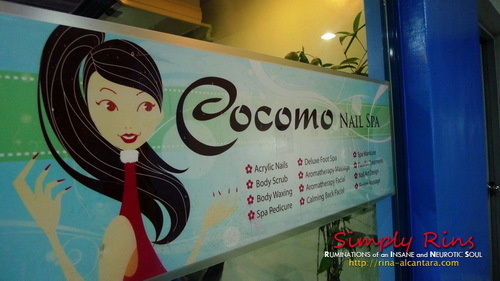 Cocomo Nail Spa is open Tuesdays to Saturdays from 10:00am to 8:00pm and on Sundays from 11:00am to 8:00pm. They are closed every Monday. It's located at the 2nd Floor of One Kennedy Place, North Greenhills, San Juan City. To make sure you'll be accommodated on your visit, call for an appointment at (632)7229245 and (632)7229275 or thru their mobile nos. 09063063729 and 09282932898. Hi, do you know that they're closing down on August 23 na? Tessa is my FAVORITE too!!! Hi, CanDIshhh! Yeah, they told me during my appointment last week. It's really disheartening. :( I've been with them for more than 5 years! It's hard to find a nail salon with Cocomo Nail's ambiance and they definitely have the friendliest staff! Made my last appointment this Wednesday.